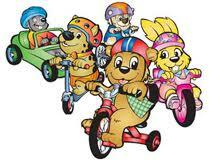 Favorite Time Academy uses the Bikewell Bear and Pedals the Bunny® to teach trike and bike safety to students. The Bike Safety curriculum is taught throughout the year during as part of our safety curriculum themes including fire safety, stranger danger, vehicle safety, and emergency preparedness.Once a year, Favorite Time Academy also hosts a St. Jude Trike-A-Thon. This event is a fun, week-long safety curriculum and fundraising program that supports St. Jude. The program is a great way for our school to teach children valuable riding-toy safety lessons, which they learn from Bikewell Bear and Pedals the Bunny® through educational materials provided by St. Jude. At the end of the week, children bring their riding toys to school to celebrate the lessons they have learned and their fundraising success for St. Jude. Bikewell Bear is a soft, cuddly bear with big eyes and a bright smile. Bikewell is a preschooler at Honeycomb School, where he is in Mrs. Huggins’s class. When he is not at school, Bikewell loves to ride his tricycle using the very important riding-toy safety lessons he learned during the St. Jude Trike-A-Thon. He’s a very smart bear who always wears his helmet when he rides, and he helps watch out for his good friend Pedals the Bunny. Pedals the Bunny is an energetic bunny with a fluffy cottontail. She doesn’t always look before she leaps, but she has a heart of gold and likes to learn while she plays at Honeycomb School. She loves to ride her tricycle with her good friend, Bikewell Bear. Bikewell and his teacher Mrs. Huggins both help Pedals practice the four most important lessons of riding-toy safety, so she can ride safely and happily with all her friends in the annual Trike-A-Thon.